If you've been to any major airport at night, you may have noticed that there are a lot of different kinds of lights, ranging from flashing white or pulsating yellow to steady red and even blue. Airport lighting is important for aircraft operating at night, but why do we need so many types? And what do all the colors mean? Airport lights can be divided into different types: General airport lighting, taxiway lighting, runway lighting, and approach light systems. General airport lighting usually includes the airport beacon and any white or red beacon lights on top of towers, buildings, and construction equipment. The airport beacon is a large, powerful rotating light that's highly visible from miles away. Public use airport beacons rotate green and white. Military airports rotate green and white but have two white lights for each green light, which differentiate them from civilian airports. And heliports rotate between green, white and yellow lights. Pilots flying cross-country can easily identify an airport at night from its beacon, making it one of the easiest checkpoints for pilots when navigating at night. Sometimes air traffic controllers can turn the beacon on and off as necessary; other times it's set on a timer. Airport buildings, towers, and other tall equipment on the field will have a small, steady red beacon on top of them to aid in collision avoidance for low-flying aircraft. Taxiway Edge. Taxiway edge lights are blue in color and line the taxiways. Airports often have green taxiway centerline lights, as well. Clearance Bar. Set inside the taxiway, clearance bar lights are steady yellow and are meant to increase the visibility of a hold line or a taxiway intersection at night. Stop Bar. Only installed at select airports, stop bar lights are meant to reinforce an ATC clearance to cross or enter a runway in low visibility situations (low IMC). They're in-pavement lights that are steady red and extend across the taxiway at a hold short line. Once a pilot is cleared onto the runway, the stop bar lights will be turned off. Runway Guard. A pair of two steady yellow lights that are positioned at each side of the taxiway at the hold short line, the runway guard lights are meant to draw attention to the hold short line - the area where a taxiway meets the runway. Runway End Identifier Lights (REILs). A pair of white flashing lights, one on each side of the approach end of the runway, that help identify the runway from taxiways at night. Runway Edge Light Systems (HIRL/MIRL/LIRL). The runway edge lights are steady white lights on the edges of the runways. On instrument runways, the white lights change to yellow during last 2,000 feet, or half the runway length, whichever is less, and then they turn red as the aircraft reaches the end of the runway. They can be high-intensity (HIRL), medium-intensity (MIRL) or low-intensity (LIRL). Touchdown Zone Lights (TDZL). Touchdown zone lights are steady white lights placed in two rows next to the centerline, starting at 100 feet and extending to the midpoint of the runway, or 3,000 feet beyond the threshold, whichever is less. Land and Hold Short Lights. When land and hold short operations (LAHSO) are in effect, flashing white lights may be seen across the runway at the hold short line. 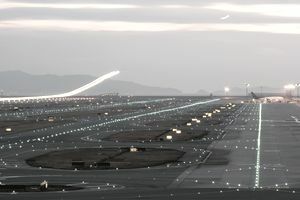 Other runway lighting may include Runway Status Lights (RWSL), which includes Runway Entrance Lights (RELs), the Takeoff Hold Light Array (THL), Runway Intersection Lights (RILs), and the Final Approach Runway Occupancy Signal (FAROS). These lights work in conjunction with surveillance systems (like ADS-B) and are fully automated. They assist in informing pilots and ground vehicle operators when it's safe to enter or cross a runway. Visual glideslope indicators are meant to give pilots a visual guide during their descent to maintain a stabilized approach. They come in two types, VASIs and PAPIs, each of which has multiple types of arrangements, but both of which give pilots a good idea whether they're on the glide path for a stable approach or not. VASIs, or Visual Approach Slope Indicators, are bars of lights on the side of the runway that, when illuminated, give pilots a visual indication of whether their aircraft is too high or too low on the approach. VASIs can be made up of 2, 4, 6, 12 or 16 lights, usually located on two or three bars - near, middle and far. Two-bar VASIs provide an indication for a 3-degree glideslope, which is typical for what should be flown during an approach. In a common two-bar VASI system, a pilot should see two red lights on the far bars and two white lights on the near bars. If all lights on the near and far bars are red, he is too low. If all lights on the near and far bars are white, he is too high. The rule of thumb pilots use is "red over white, you're alright." PAPI stands for Precision Approach Path Indicator. PAPI lights are arranged horizontally, and typically include four lights that can be red or white, depending on where the aircraft is n the glideslope. A typical PAPI system is located on the left side of the runway. When all four lights are white, the aircraft is too high. As it descends onto the glide path, the lights on the right side will begin to turn red. When an aircraft is on the precise glide path, the two left lights should be white, and the two right lights should be red. When three or more lights are red, it indicates that the aircraft is too low.